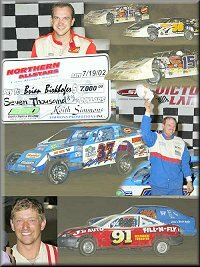 Friday, July 19th the Farley Speedway hosted the Northern All Stars Late Model Series for a special racing event. 46 of the Midwest�s and the Ohio/Indiana based All Stars Late Model squared off to see who could pick up the win in the 50 lap main event and the whopping $7,000 feature winners purse. 4 Late Model heats and two consolations were run to set the starting field of 24 drivers for the 50-lap feature. The green flag waved with pole sitter Darren Miller taking the point position but he had his hands full with a very strong running David Eckrich. The two local hot shoes raced side-by-side lap after lap as they moved away from the field. The race was slowed only one time and unfortunately it was for a flat right rear tire on the 58 car of David Eckrich. The caution bunched the field on the 36th lap. Brian Birkhofer started the race in the 21st position and had steadily worked his way to the front and was running in the fourth position when the race restarted. Birkhofer moved into second passing Ray Guss shortly after the restart. Birkhofer was able to close in on Miller but it was not until the white flag lap that Birkhofer was able to make the pass in turn one and was able to secure the lead on the back chute of the final lap. Birkhofer led less than one lap on his way to the big win. Miller settled for second ahead of Rick Aukland and Ray Guss Jr. Matt Furman rounded out the top five. An outstanding group of Eastern drivers made the trek to the Farley Speedway for the two days of racing which will also include a Renegade Dirt Car Series race on Saturday, July 20th. In the companion feature events on Friday night, Ron Barker continued his dominance of the Farley Speedway in scoring another Modified feature win. Barker started deep in the field but quickly worked to the front taking the lead from Jason Schueller on his way to the win. Jim Thompson won his first ever Farley Flyer feature win on only his third night of racing at the Farley Speedway. Thompson took the checkers ahead of Jason Roth.